MTM2.com • View topic - Have these been made? Post subject: Have these been made? I've looked all thru the search thing for trucks and I haven;t seen any of these: Trucks with slim tractor tires (like a mud bog truck not a sand drag truck), and tractors like from the truck and tractor pull shows. Also any trucks or tractors with pulling sleds hooked to the back. And is there any trucks with dual big tires? I seen the Bigfoot one, but the truck its self looked small. You won't find trucks with pulling sleds because they can't be placed on and removed from the truck while in game, also they won't turn with the truck. You could place a sled on the back of a truck in Binedit, but it will always stay with the truck, and always stay straight. I couldn't help you with the tractor trucks though. Oh ok, I guess if MTM2 had drag racing like MTM1 it would be possible or useful lol. Thx i think i only found 1 with the tractor tires. I don't really care for the mud/sand boggers with the cleat tires. If it isnt good enuff, have someone redo it, make a better one. Hey,Rep Fan, Krimson Krusher is realy nice truck. CYCLOP. Have a dual tires too and looks nice. 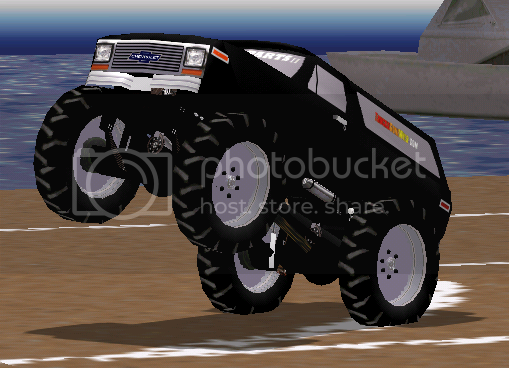 I have made this truck its almost rdy to be released. Didn't the ORIGINAL Grave Digger, a red pickup used for mud-bogging, start out with tractor tires? I thought someone had made that one at some point in the past. Rep_fan perhaps? Yes, it did have them. Dennis has a pic of it at http://monsterphoto.iwarp.com/gdpck.htm. (you may have to copy and paste the link in your address window to see it). Wow! Did you make that? If so it's for release right? Yes, and yes it will be in a pack of trucks like that. Better watch it, Taft will find you. YOU DON'T HAVE PERMISSION TO TAKE PHOTOS FROM MY SITE AND POST ANYWHERE ON THE WEB. REMOVE ALL YOU HAVE TAKEN. Yeah BD, I made his red primered orig GD pickup, it sucked too, but its out there. Its on my site, and should be here too. I also made lots of other trucks with tractor tires on em, Gigantic Orange Crush, Walkin Tall, have fatter tractor tires. Just cut up my Krimson, thats yer best bet, use what ya want. People used to yell at me all the time to make Cyclops, I just never did, never thought it was that purdy, respectable truck, just didnt do anything for me. Plenty of people out there that can in my place now. Lol. I remember that whole thing on Mayhem back around Halloween. It's funny how Dennis is oblivious to the fact that he totally stole those pics in the first place. Back on topic, it would be cool if someone made the old Cyclops with the dual tractor tires. And RKM, those TGW trucks are awesome.